We “Ocean International.” are a recognized manufacturer and supplier of an exclusive array of PP-TQ Blown Film Plant. This plant is provided with variable screw diameters. It is manufactured under the supervision of skilled technocrats using high quality components as per the international quality standards. The offered PP - TQ Blown Film Plantis known for giving excellent output. It is very simple to operate & maintain and is offered at market leading prices. Polypropylene is a popular ingredient that is applied to produce transparent and light weight packaging films. PP –TQ blown film plant can be chosen with moderate to higher production capacity. PP-TQ blown film line is used in majority in textile and food industries in majority. 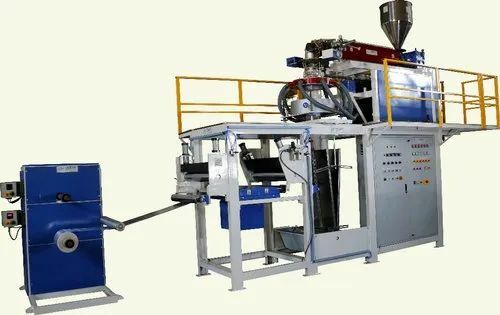 PP-TQ blown film machine is equipped with suitable components including latest gear box and motor for reducing power consumption and increasing the production capacity as well. We feel proud to introduce ourselves as the leading manufacturer and supplier of premium class range of PP Blown Film Plant. The plants we engineer at our end are fabricated as per the defined industry standards and norms, making use of finest grade metals, components and materials. Clients demand these plants for their robust construction, rust proof finishing and longer functionality. Being a well established organization, we bring forth an excellent quality PP Blown Film Machine.These film plants are manufactured under the guidance of our skilled professionals using pristine grade raw material and modernizes machinery in accordance with set industry standards. These film plants are widely demanded in the market for some of their striking features. Also, clients can avail these film plants from us in precise sizes at industry leading prices. We “Ocean Extrusions Pvt. Ltd.” are a recognized manufacturer and supplier of an exclusive array of PP Blown Film Machine Manufacturer. This plant is provided with variable screw diameters. It is manufactured under the supervision of skilled technocrats using high quality components as per the international quality standards. 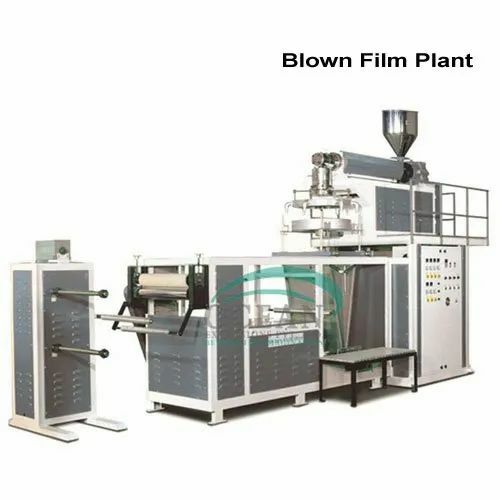 The offered PP Blown Film Machine Manufacturer is known for giving excellent output. It is very simple to operate & maintain and is offered at market leading prices. Polypropylene is a popular ingredient that is applied to produce transparent and light weight packaging films. PP Blown Film Machine in India can be chosen with moderate to higher production capacity. PP-TQ blown film line is used in majority in textile and food industries in majority. PP-TQ blown film machine is equipped with suitable components including latest gear box and motor for reducing power consumption and increasing the production capacity as well. We “Ocean International.” are a recognized manufacturer and supplier of an exclusive array of PP-TQ Blown Film Plant. This plant is provided with variable screw diameters. It is manufactured under the supervision of skilled technocrats using high quality components as per the international quality standards. The offered PP-TQ Blown Film Plant is known for giving excellent output. It is very simple to operate & maintain and is offered at market leading prices. - Higher Crystallization Formation of Spherulites, as the melt solidifies. - Possible to Get Smaller Size. - Spherules, by Quenching of the Film. Being a well established organization, we bring forth an excellent quality PP Blown Film Plant.These film plants are manufactured under the guidance of our skilled professionals using pristine grade raw material and modernizes machinery in accordance with set industry standards. These film plants are widely demanded in the market for some of their striking features. Also, clients can avail these film plants from us in precise sizes at industry leading prices. We “Ocean International.” are a recognized manufacturer and supplier of an exclusive array of PP Blown Film Line. This plant is provided with variable screw diameters. It is manufactured under the supervision of skilled technocrats using high quality components as per the international quality standards. The offered PP Blown Film Line is known for giving excellent output. It is very simple to operate & maintain and is offered at market leading prices. Polypropylene is a popular ingredient that is applied to produce transparent and light weight packaging films. PP –TQ blown film plant can be chosen with moderate to higher production capacity. PP Blown Film Line is used in majority in textile and food industries in majority. PP Blown Film Line is equipped with suitable components including latest gear box and motor for reducing power consumption and increasing the production capacity as well. We feel proud to introduce ourselves as the leading manufacturer and supplier of premium class range of PP Blown Film Line. The plants we engineer at our end are fabricated as per the defined industry standards and norms, making use of finest grade metals, components and materials. Clients demand these plants for their robust construction, rust proof finishing and longer functionality. Being a well established organization, we bring forth an excellent quality PP - TQ Blown Film Line.These film plants are manufactured under the guidance of our skilled professionals using pristine grade raw material and modernizes machinery in accordance with set industry standards. These film plants are widely demanded in the market for some of their striking features. Also, clients can avail these film plants from us in precise sizes at industry leading prices. Being a well established organization, we bring forth an excellent quality PP - TQ Blown Film Machine.These film plants are manufactured under the guidance of our skilled professionals using pristine grade raw material and modernizes machinery in accordance with set industry standards. These film plants are widely demanded in the market for some of their striking features. Also, clients can avail these film plants from us in precise sizes at industry leading prices. Being a well established organization, we bring forth an excellent qualityPlastic Extrusion Plants - Blown Film, PP - TQ Blown Film Plant.These film plants are manufactured under the guidance of our skilled professionals using pristine grade raw material and modernizes machinery in accordance with set industry standards. These film plants are widely demanded in the market for some of their striking features. Also, clients can avail these film plants from us in precise sizes at industry leading prices. Being a well established organization, we bring forth an excellent quality PP - TQ Blown Film Machine Manufacturer.These film plants are manufactured under the guidance of our skilled professionals using pristine grade raw material and modernizes machinery in accordance with set industry standards. These film plants are widely demanded in the market for some of their striking features. Also, clients can avail these film plants from us in precise sizes at industry leading prices. We “Ocean International.” are a recognized manufacturer and supplier of an exclusive array of PP - TQ Blown Film Machine in Ahmedabad. This plant is provided with variable screw diameters. It is manufactured under the supervision of skilled technocrats using high quality components as per the international quality standards. The offered PP-TQ Blown Film Plant is known for giving excellent output. It is very simple to operate & maintain and is offered at market leading prices. Polypropylene is a popular ingredient that is applied to produce transparent and light weight packaging films. PP –TQ blown film plant can be chosen with moderate to higher production capacity. PP-TQ blown film line is used in majority in textile and food industries in majority. PP - TQ Blown Film Machine in Ahmedabad is equipped with suitable components including latest gear box and motor for reducing power consumption and increasing the production capacity as well. Being a well established organization, we bring forth an excellent quality PP Blown Film Plant in India.These film plants are manufactured under the guidance of our skilled professionals using pristine grade raw material and modernizes machinery in accordance with set industry standards. These film plants are widely demanded in the market for some of their striking features. Also, clients can avail these film plants from us in precise sizes at industry leading prices. Being a well established organization, we bring forth an excellent quality PP - TQ Blown Film Extrusion Plant.These film plants are manufactured under the guidance of our skilled professionals using pristine grade raw material and modernizes machinery in accordance with set industry standards. These film plants are widely demanded in the market for some of their striking features. Also, clients can avail these film plants from us in precise sizes at industry leading prices. Being a well established organization, we bring forth an excellent quality PP - TQ Blown Film Extrusion Machine.These film plants are manufactured under the guidance of our skilled professionals using pristine grade raw material and modernizes machinery in accordance with set industry standards. These film plants are widely demanded in the market for some of their striking features. Also, clients can avail these film plants from us in precise sizes at industry leading prices. Looking for “PP - TQ Blown Film Plant 1”?